The camera lucida is generally considered to have been invented by the English chemist W. H. Wollaston in 1806-07, although there is some speculation that it is a reinvention of a device described by Kepler some 200 years earlier. The term camera lucida means 'light room' and it indicates that the device didn't require the darkened space that had been necessary for the earlier camera obscura. There is no projected image and it is based on very different optical principles. A camera lucida consists of a simple prism and lens that allow an artist to see the scene that they depicting superimposed over the paper that they are drawing on, so that they can simply trace around the image. 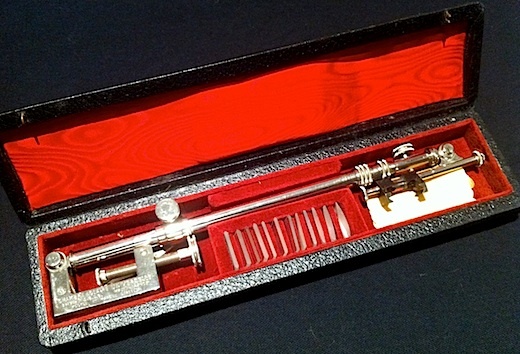 The rest of the device comprises of a clamp and extendable arm, with which it can be securely fixed in position to one side of the artist's drawing board or sketch pad with the prism set at a convenient height. A French camera lucida or 'Chambre Claire Universelle', made by Breveté S.G.D.G., with a set of 12 numbered lenses. Detail of the prism (set within the black holder) and lens. 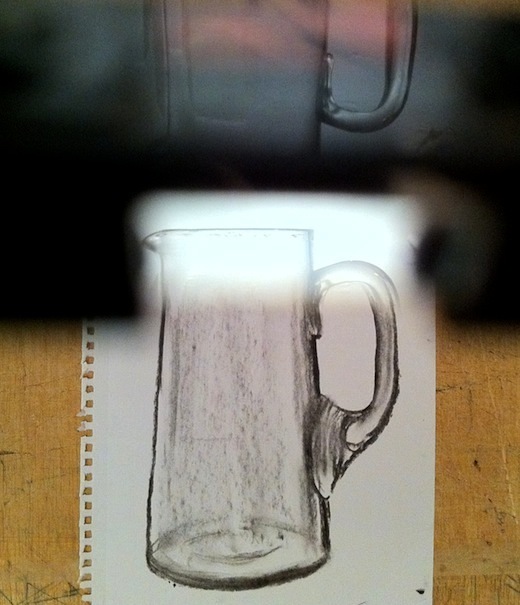 Looking downwards through the very edge of the prism, the subject is seen the correct way up on the drawing surface, as shown in the above photos. As the superimposed images tend to be quite faint, white paper can be too bright for the image to appear clearly. Drawing in chalk on black paper can be used to achieve better results. 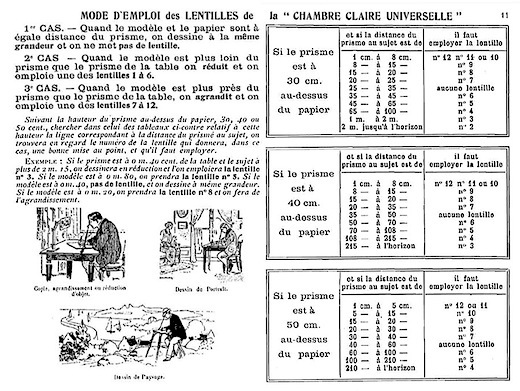 These instructions for the 'Chambre Claire Universelle' explain which of the different numbered lenses is to be used in various circumstances, dependant on the height of the prism above the paper and the distance of the subject being drawn. 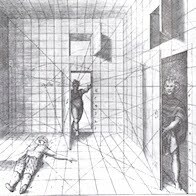 Increasing the height of the prism above the drawing surface creates a larger image. 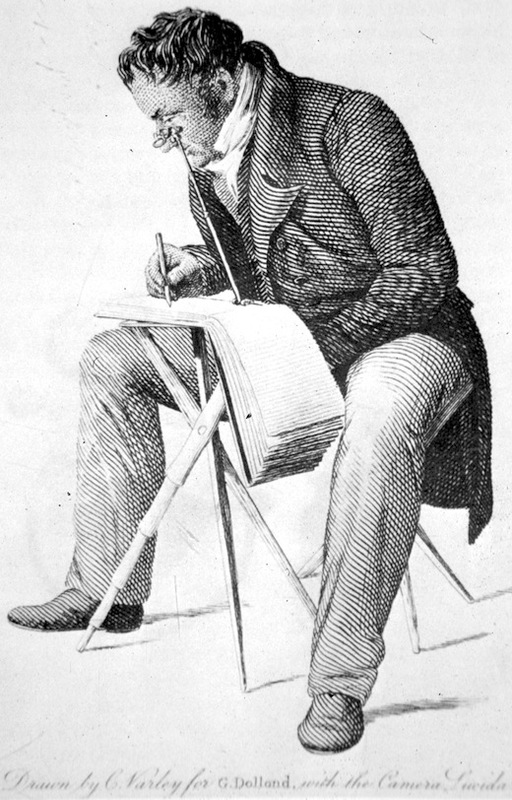 A 19th century engraving by C. Varley made using a camera lucida, depicting G. Dollond who is also drawing with the device. George Dollond (1774-1852), who was a noted maker of telescopes and other optical instruments, helped popularise the camera lucida in England. It was after using a camera lucida in 1833 that the the pioneer of photography William Fox Talbot began his attempts to fix images chemically. David Hockney has speculated on how great artists have used the camera lucida in his book 'Secret Knowledge: Rediscovering the Lost Techniques of the Old Masters'. (for a very brief summary of some of these ideas, see his article in RA Magazine from Summer 1999). A two-part BBC documentary based on Hockney's book is available on YouTube (Pt1, Pt2). Further information on how to use a camera lucida can be found at Gilai Collectibles. For an updated take of the same principle, an iPhone and iPad app called Camera Lucida is available which allows photographs taken with the camera to be traced onto paper, as demonstrated here. Excuse me if I am out of line here, but I thought that anyone reading it might be interested in a workshop on making images with pre-photographic equipment at the George Eastman House.